Ok so I’ve done this a couple of times recently to play around with the idea. The great thing about this recipe is you can mix it up depending on what flavours you fancy plus it’s a really great cut of meat to use if you are on a budget. This recipe I’ve done here is for Chinese Roast Pork. Now I could have just gone online and copied the recipe but I didn’t. This is how I do it. If it closely resembles a recipe online somewhere they’ve either copied me or I am a genius and I’ve managed to figure out a 300 year old recipe from eating it so much from china town in the last 5 years. This is entirely possible. 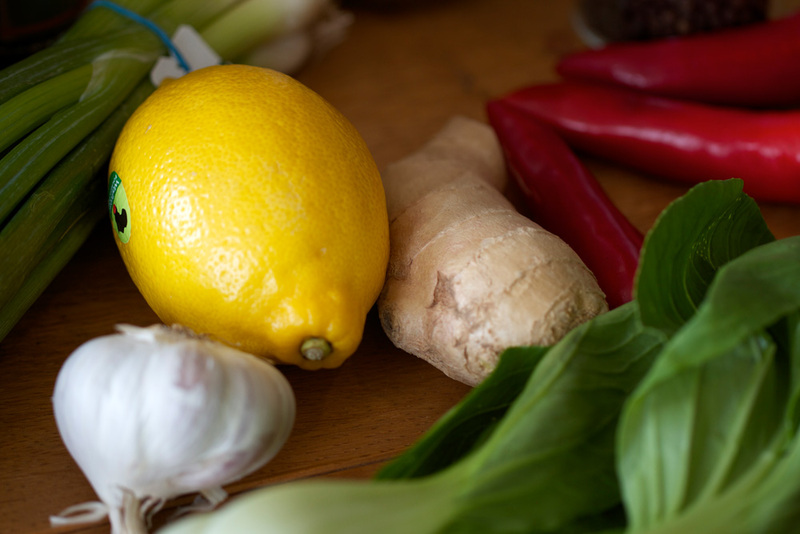 For this recipe you will need some general Chinese ingredients. I use all of these a lot and they are really worth investing in. It does seem a bit pricey the first time you get them all but once you have them a world of tasty Chinese recipes open themselves up to you. There does seem like a lot of ingredients here but don’t be put off, this is a really simple recipe to cook as it’s done in stages so it’s very easy to get the timings right. 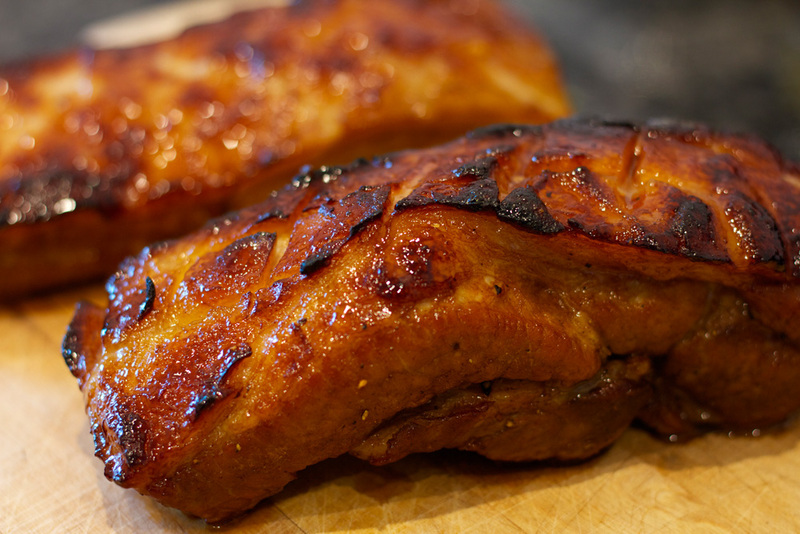 Boneless belly pork. I used two pieces, 750 grams each cos it is well tasty and then you get some left over to munch on the next day. Try and get one whole piece rather than pre-cut up slices. If you look at the pork then you want a nice meaty bit with some nice fat layers in there with a nice bit of fat on top. We will cut off a bit of fat from the top when we go to the second stage of cooking but we want the fat for the first stage as this really helps with flavour and juiciness. 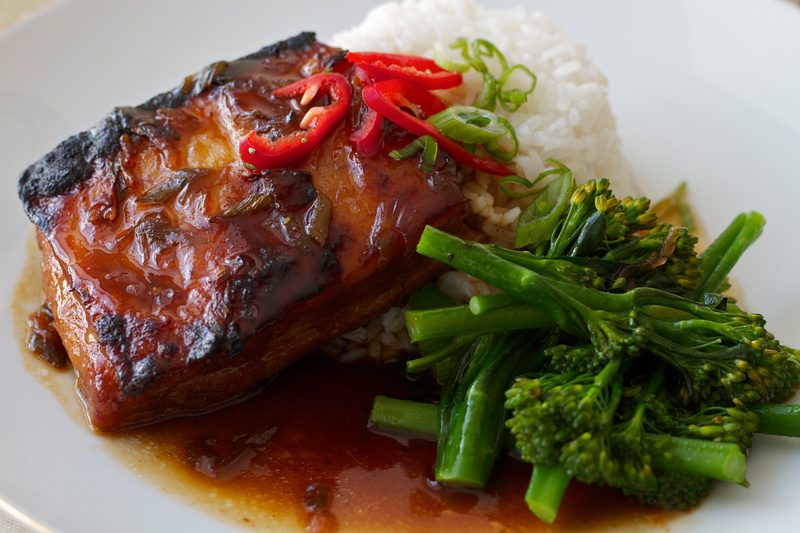 To serve with it I used Jasmine rice, some Boc Choy and some of those thin broccoli things. I don’t know what you call it, mini broccoli or something. 1. Ok so the first stage of cooking the pork. Get a nice large deep sauce pan. Roughly chop up a large thumb size piece of ginger, the 2 chilli’s, 3 cloves of garlic and the bottom half of 6 spring onions. Add all these to the pan along with a teaspoon of pepper corns and the half lemon cut into quarters. Now add the pork belly and fill with water. You want to cover the pork with about an inch of water. 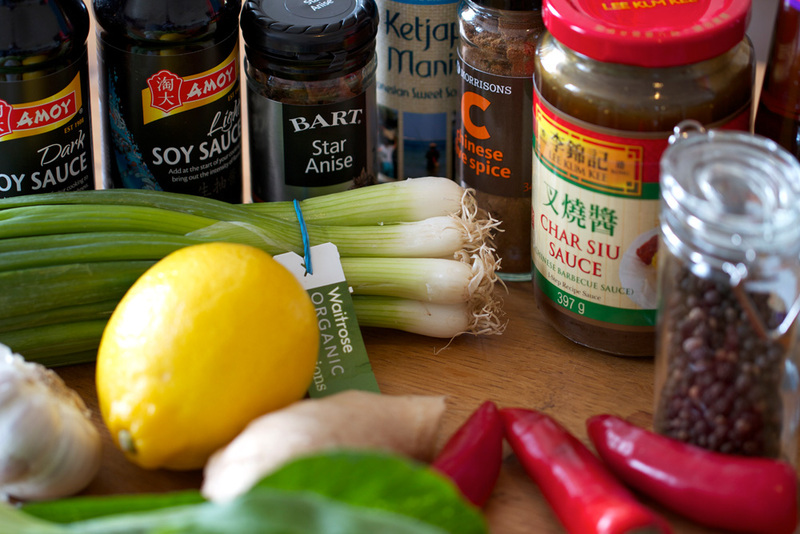 Ok now add a tablespoon of light soya sauce, a tablespoon of dark soya sauce and a sprinkle of Chinese five spice and one star anise. The star anise should come in a star shape but sometimes they break up so if they have then half a teaspoon is fine. It’s very strong so you don’t need much to get the flavour. Finally add a dash of sesame oil, just a couple of drops is fine. Put the pan on the heat and bring to the boil. As soon as it is boiling tun down the heat as low as it will go and put the lid on and leave gently cooking for 2 hours. 2. That is the hard part, the rest is really simple. 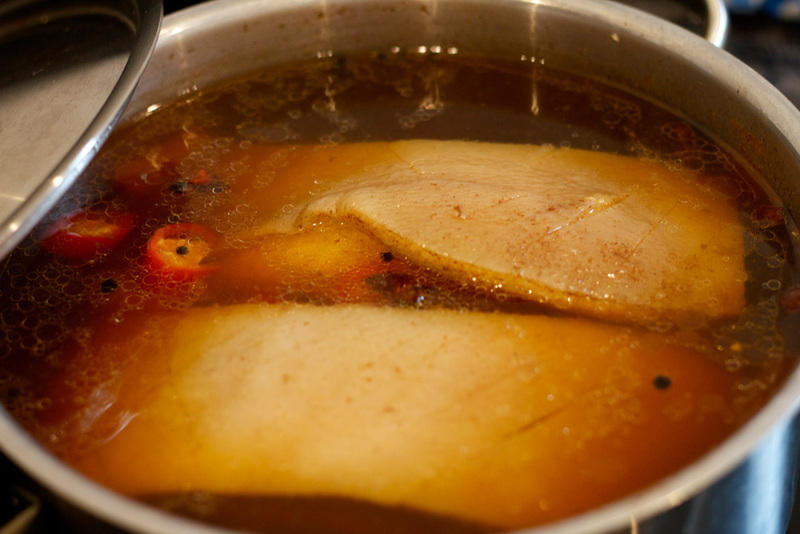 While the pork is cooking get a bowl and add 3 tablespoons of the char sui sauce a teaspoon of light and dark soya sauce, a teaspoon of the Ketjap manis and 2 drops of sesame oil. Give this a good mix and put to one side. 3. Now we want to prepare the rice. Get a tea mug and fill with rice and put in a deep medium size sauce pan and add water so you cover the rice. Give a little stir and put to one side. We are going to leave the rice to soak to help get rid of the starch. This is a really great way to prepare the rice, we want to try and give it at least 30 mins to soak but more is fine. 4. Ok so after the 2 hours remove the pork pan from the heat and leave to cool slightly for 10 mins. While this is happening turn on the oven to 230-250°C. We want it as high as it will go really. Ok now remove the pork from the pan onto a chopping board. We want to cut of some of the fat from the top of the pork, you’ll see there is a tougher bit of skin which is the rind. We want to cut this off. Be very careful with the knife as the fat is a bit tricky to cut off. Finally score the fat on top in a criss-cross pattern and place a deep oven roasting tray. Now get the bowl of sauce we mixed earlier and spoon all over the pork. Make sure to do the fat side last and make sure this side is facing up. Get a ladle and put about 4-5 ladles of the liquid you cooked the pork in into the bottom of the oven tray around the pork. You want it about 1cm deep. Be careful not to put over the pork as you don’t want to wash off the thick sauce. Now put in the oven for about 20-25 mins. 5. As soon as you put it in the oven drain the water from the rice and get the tea cup you used to measure the rice and put 1 and 3/4 cups of water over the rice, add a pinch of salt and put on the heat with a lid. Bring to the boil then turn right down to a very gentle simmer. Do not take the lid off until you are ready to serve. Don’t worry the rice won’t burn! 6. After 20 mins check the pork in the oven, it should have taken on some nice colour. You need to keep an eye on it as you don’t want it to burn, just caramelise slightly. If it looks like you want to give it longer then give it another 5 mins just keep an eye on it. Every oven varies so you just need to watch it and get it out when it looks done. 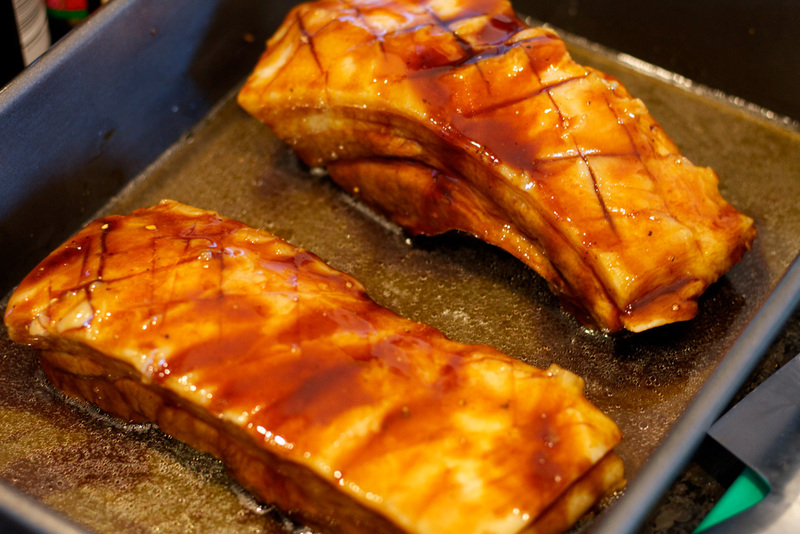 If your oven is a bit crap then for the last 5 mins turn on the grill to get the top of the pork nice caramelised. As soon as it’s done remove from the oven and place on a chopping board to rest for 10 mins. 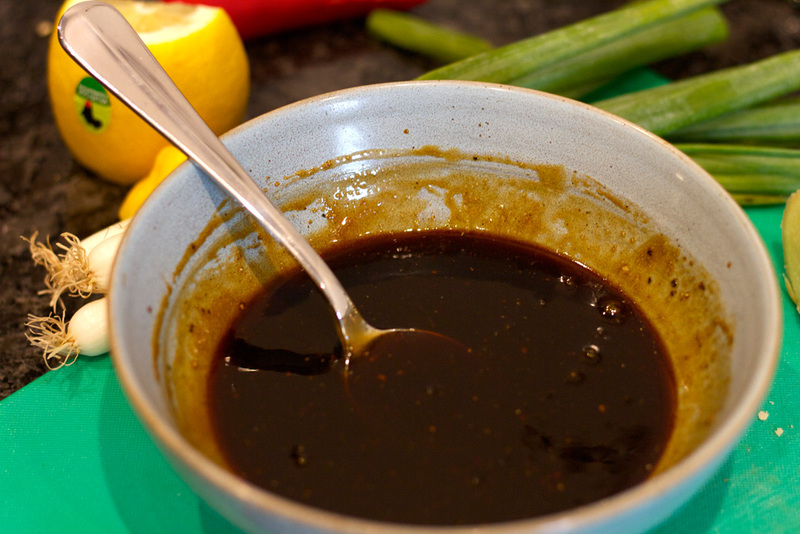 With the sauce you have left in the oven dish pour it into a bowl with some chopped spring onion and some chopped chilli if you like a bit of spice and give it a stir. You don’t need to do much else as it will have thickened in the oven while the pork cooked. If you need more sauce then you can get a ladle of the liquid you cooked the pork in into a pan, bring to the boil and add the liquid from the oven dish and mix well. then add the fresh chilli and spring onion, stir and remove from the heat. 7. While the pork is resting get the vege on. You really don’t need to stress and rush this bit as the pork can rest for longer if needed and the rice will sit there on a very low heat and be fine until you need it. Now, for the vege I used a steamer but a lot of people may not have one so I’ll give you a really good way of cooking the vege. Get a frying pan that you have a lid for or a large sauce pan and add about 2-3cm’s of water and bring to the boil. Add a pinch of salt and add the vege. Lid on and cook for 4-5 mins and drain. Sorted. It’s kind of like a cross between steaming and boiling. Don’t do anything to fancy to the vege, once drained just add a splash of light soya sauce or a pinch of good sea salt is great. 8. Cut up the pork in slices and serve with the rice and vege and spoon over the sauce. 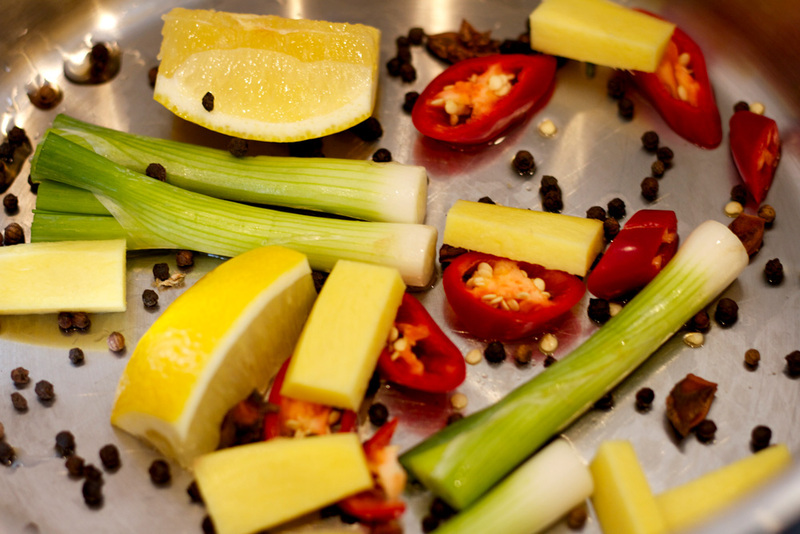 Add a few sprinkled bits of spring onion or red chilli as a nice fancy garnish. Nice. Now I didn’t really go into what you could do if you didn’t want to do a chinese roast pork. For the first stage you can use things like carrots, parsnips, onion, garlic and some herbs to put in the pan with the water. Cook for 2 hours then when you roast it in the oven make a honey thyme and lemon glaze and serve with some roast vege and gravy. You could incorporate some Moroccan or Indian spices in there if you like. Anything really. As long as you follow the idea of slow cooking it in the water with some flavours first then roast it with some sort of tasty strong flavours you will be onto a winner. Give it a try and see how you go!